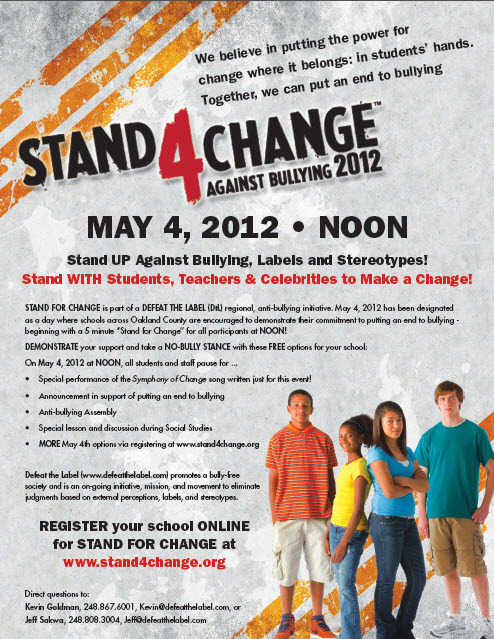 Stand 4 Change on May 4: STOP the Bullying! “We believe in putting the power for change where it belongs: in students’ hands. Teachers, administrators and students looking to introduce or reinforce an anti-bullying message will find plenty of free support through a new, rapidly-expanding local initiative. STAND 4 CHANGE DAY is a one-day “take notice” exercise from the Defeat the Label ANTI-BULLYING campaign. Officially recognized by the State of Michigan, May 4, 2012 has been designated as a day where schools across the nation are encouraged to demonstrate their commitment to putting an end to bullying, beginning with a 5-minute “Stand 4 Change” for all participants at 12:00 EST. Stand 4 Change Day was created by Defeat the Label and by Ken Kragen. Ken (an “author, speaker, non-profit consultant, TV & film producer and music manager”) is internationally known as the creator and organizer of “We Are the World”, “Hands Across America” and Cisco System’s “Net Aid”. Defeat The Label is a 501(c)3 organization that creates critical awareness of bullying issues among middle school and high school aged students. The group is spreading word of their mission through the creation of awareness campaigns, community outreach, special events and the implementation of the Anti-Defamation League in-school curriculum. Defeat the Label has also been very active in support of the highly-praised documentary, Bully, and provided a discussion panel at the movie’s recent Birmingham premiere. ***BULLYING THERAPY will be offered to victims, bullies, bullying bystanders and families in a new, cutting-edge Beaumont Hospital clinic. The No Bullying Live Empowered Center (NoBLE), is scheduled to open on May 4th.